The previous knowledge of the children will be varied. Some children may have previous day care or school experience, others will be inexperienced preschoolers. Some will have exposure to many different children through family or friends, others will be limited in peer social interaction. Such a varied range of previous social knowledge should be respected and considered. Teachers make a natural effort to memorize class lists before children arrive, but if possible, teachers should attempt to place a name with a face through pictures submitted with entrance paperwork or through other possible means. Preparation for the first day of school includes making name cards and placing the name cards on tables in groups of three or four. Introduce the following meet and greet lessons during the first week of preschool. The objectives for day one are to allow children to ease into the group setting and get to know a few students at a time, rather than have the pressure of meeting the whole group at once. Ask students to color individually, and then encourage them to talk to a group of three or four students; this will ease pressure and allow students to have a bigger voice on the first day of school. This activity builds individual confidence which will assist with group confidence necessary for the activities on days two, three and five. Place coloring pages on the tables with one box of crayons per table. Allow the children to color the pages while sharing the crayons. Travel through the room and encourage children to talk to each other while coloring. Ask individual groups about their artwork and ask some students to explain their art to the table to start table wide conversations. This lesson works best if the class is split into small groups of three or four. Point out the name tags and ask each student if they can read the tag. Call the table’s attention to the name tags and illustrate that each name tag belongs to the person sitting in that assigned seat. This simple lesson is a great first day meet and greet for smaller groups, and will help students sheer ease into the classroom. The objective for day two will be to further ease individual students into the group. Asking the children to stay at their seats gives them a “home”, which instills security. From this safe, secure spot, children will be able to share with the class as a whole. Shy children will be able to stay seated while they talk about their new friends, while outgoing children will be able to stand and look around the classroom. This lesson extends the lesson of day one because the children are allowed to demonstrate the prior day’s knowledge and introduce a fellow classmate to the room as a whole. Day two will find the students back in their assigned seats, but then each student will be called upon to speak to the whole class. Each student will be asked to look at the person sitting across from them and think of one nice thing they know about that person. After a moment of consideration, students will be asked to stand one by one and state one known fact about their new friend. Answers may be as simple as, “He draws a nice picture,” or “She likes green,” or complex like, “She has two dogs and one cat at home.” The answers depend on how much conversation the children used the day before. The outgoing children in the class now have their time to shine. Day three’s objective will be to introduce the students to the group as a whole through their own words and interests. Hosting a sharing day will allow students to speak to the group and further describe themselves. The students will begin to know and recognize each other at this point, as days one and two helped individuals get to know each other. This group activity, as it is the first one the class will share as a group, will help students find others who have similar interests. Friendships will have begun to form by this point, and students may find new common interests when this activity is finished. Ask parents to allow children to bring one small item to class on this day. Gather children into a group and allow each child to share their item from home. This meet and greet lesson will help students begin to feel an ownership of the classroom by mixing home with school. The show and tell aspect of the activity will show off the individual interests of each child, and help the class learn more about each other. Assist shy students with sharing in front of the class, and ask leading questions for students who may be short on words. Objectives of day four include students creating a decoration for the classroom. Students will begin to feel acclimated into the classroom by day four through new friendships and learning more about their classmates. Now it is time to give children a sense of ownership within the classroom. 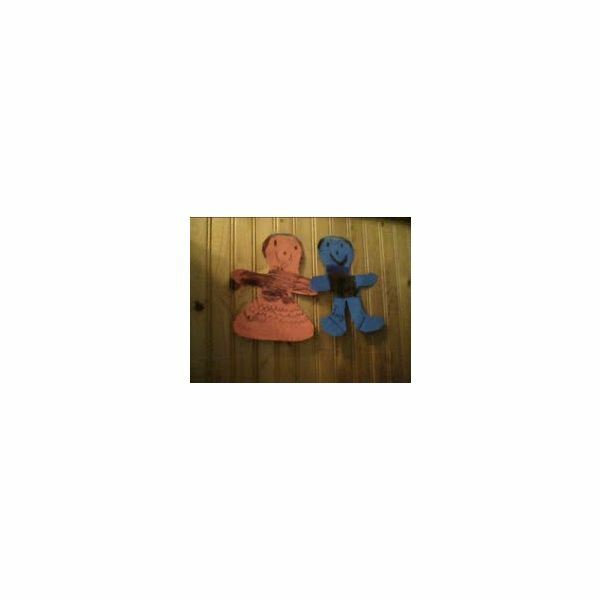 This decoration will express each child as an individual, and when it goes on the wall in a chain link, the children will be able to see themselves within the classroom. At this point you will begin to ease out of the meet and greet week. Prepare one paper person for each student and place the people at each seat at the tables. When students arrive, allow them to use varied decorations to decorate the people with drawings of their favorite objects or other personal symbols and help them copy their names to the drawing. When the drawings are finished, gather the newly created “people” and talk about each of the students’ creations with the class as a whole. Discuss the drawings and what interests each specific child. Create a chain from the people and attach the chain to a wall in a common area. This project creates a further ownership of the classroom for the students as it begins to personalize the classroom and helps the group identify with each other. The objective of the fifth day is to solidify all the activities completed throughout the week and have all students greet each other with a fun song. Students will know each other’s names, have budding friendships and begin to feel comfortable in the preschool environment. This fun song, when sung by the whole group, will review names and solidify the group as a whole. The final meet and greet lesson includes a group greet. The children have been together all week and have been learning about each other, and are ready to be immersed into the group setting. At circle time, greet each child with the following good morning song, sung to the tune of “Farmer in the Dell”: “(Name) is here today, (name) is here today, cheer cheer we’re glad he’s here, (name) is here today.” Ask the child in the song verse to stand and dance, clap, or wave. Encourage all children to participate in the song so each individual child is greeted by the group. This last-day activity can be continued every day, and it is used on the fifth day of the week-long lesson plan to reinforce all the names of the students reviewed over the week. The children should be learning each others’ names and beginning to assimilate themselves into the group. Every day, after the lesson is finished, the students will be observed during freeplay to discover if they are using the information discovered about each other to make friends. For example, a student who talked non-stop about Spiderman may be observed during freeplay building a Spiderman tower with another student who is also interested in the action hero. This type of interaction demonstrates that students are getting to know each other and are attempting to use the new knowledge to make friends and meet new peers. The point of meet and greet week is to get the group acquainted and assimilated to the classroom, and assessment through observation will demonstrate how children are getting to know each other. Source: Author's experience from teaching in the classroom.